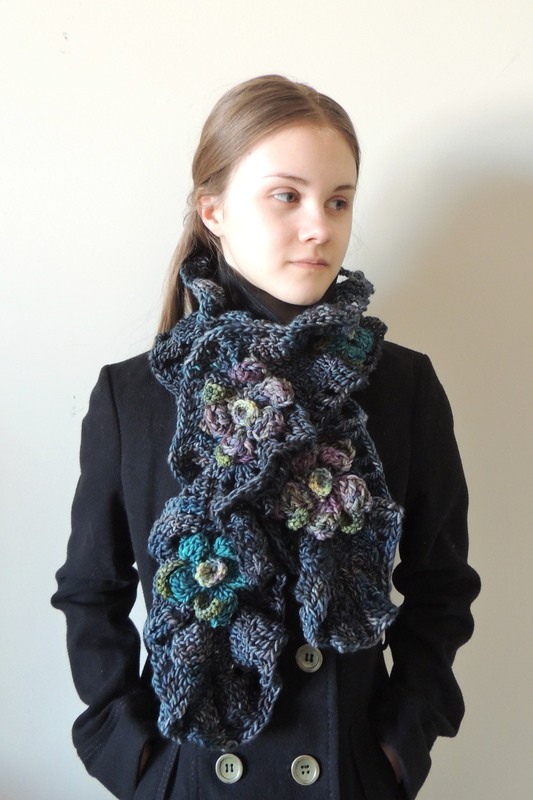 The Hand Painted Garden scarf is another version of my Hand Spun Garden. I wanted to do a different combination of yarns using only hand painted yarns on this design. The blue grey background is one of my favourite colours in this hand painted merino wool. It is reminiscent of the midnight sky with some muted flowers light by the moonlight strewn around the garden path. This is one of my newest designs that will be available in other colours or an all ivory one for the classic touch. I hope today finds you with great inspiration to try something new. Have a great one! That is very beautiful. Love the colors! Thank you very much! 🙂 I appreciate your kind comments!